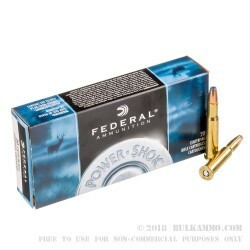 Federal’s Power-Shok .30-30 Winchester ammunition is loaded with 125-grain soft point hollow point projectile into boxer-primed, noncorrosive brass cases with a primer pocket sealant. 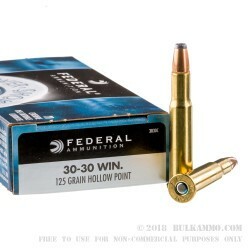 These .30-30 rounds are an ideal load for your brush gun this deer season, as Federal’s soft point hollow point design offers controlled expansion and decent weight retention. This makes for less tracking after shooting that monster Whitetail buck. 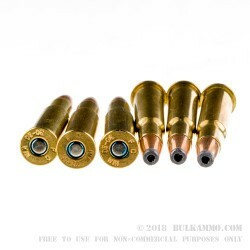 These rounds are capable of a muzzle velocity of 2570 FPS and are still hard-hitting even over longer distances. Federal’s Power-Shok line delivers quality, consistent performance at an excellent price. 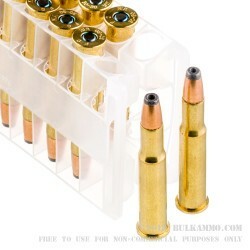 Each box of Federal .30-30 Winchester comes with 20 rounds. Known for being on the cutting edge of ammunition technology for nearly 100 years, Federal has provided top quality ammunition in a wide variety of calibers. Based in Anoka, Minnesota, Federal’s name has become one and the same with American-made quality ammunition.